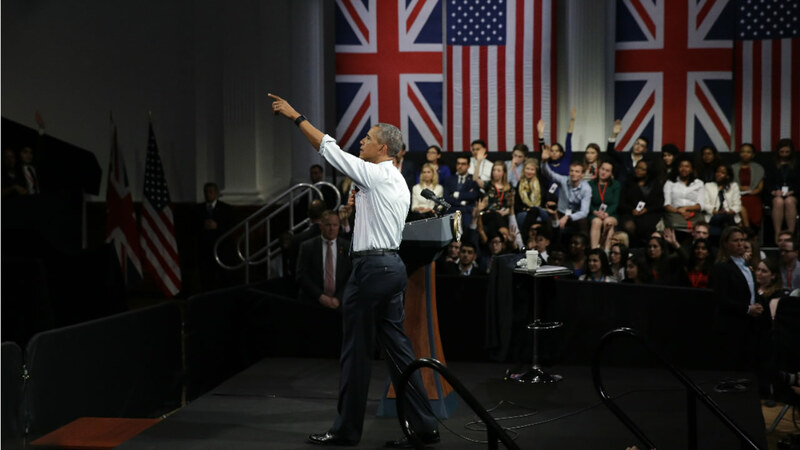 LONDON -- President Barack Obama on Saturday urged the next generation of British leaders to give serious thought to how they solve problems, turning a light-hearted question about priorities for his successor into a treatise on his preference for diplomacy over military conflict. Obama said keeping U.S. citizens safe is his top priority and he suggested that it should also top the list for whomever Americans elect in November due, in part, to the threat posed by the Islamic State group and other extremist organizations. How those issues are handled is important, he said. Leaders need to recognize "that security is not just a matter of military actions but is a matter of the messages we send and the institutions that we build and the diplomacy that we engage in and the opportunities that we present to people," Obama said in a question-and-answer session with young leaders. Such events are a staple of his foreign travels. "That is going to be important for the next president of the United States and any global leader to recognize," Obama said. Obama held up the recent nuclear deal with Iran as an example of the power of diplomacy over force. "Doing so without going to war is something I'm very proud of," he said. The question, however, was about priorities for his successor and the audience applauded loudly when the questioner suggested that person will be a "she," as in Democrat Hillary Clinton, or "could be Bernie," a reference to the other Democrat still in the race, Bernie Sanders. Obama passed up the chance to comment on the fierce campaign to succeed him, but said he'd love to see a focus on early childhood education. Asked about his legacy, the president said he wouldn't have a good feel for it "until 10 years from now and I can look back with some perspective." But still, he cited his health care law, financial industry reform, the Iran nuclear deal and "saving the world economy from a great depression" among the issues he hopes to be remembered for. Obama said he'll review a scorecard after leaving office. "I think that I have been true to myself during this process. Sometimes I look back at what I said when I was running for office and what I'm saying today and they match up." Obama packed the last day of what is likely his final visit to London as president with a slew of events. He began by taking in a brief performance cribbed from William Shakespeare's "Hamlet," including portions of the prince of Denmark's famous "to be or not to be" soliloquy at the Globe theater. It was his way of participating in commemorations of the Bard on the 400th anniversary of the playwright's death. The Globe is a replica of the circular, open-air playhouse that Shakespeare designed in the 16th century. After leaving the theater, Obama participated in the town hall, met privately with Labour leader Jeremy Corbyn and was driven an hour outside the city, past famous London landmarks, to squeeze in his regular round of weekend golf. He and Prime Minister David Cameron were playing at The Grove golf course in Hertfordshire. The Grove, which boasts a championship course and will host the British Masters tournament in October, is Obama's first overseas golf destination as president. Obama and Cameron met for talks on Friday. They were having dinner Saturday night with U.S. Ambassador Matthew Barzun at the envoy's government residence. Obama heads to Germany on Sunday for talks with Chancellor Angela Merkel and other top European leaders. He was also scheduled to help Merkel open the world's largest industrial technology trade show before he heads back to Washington on Monday.